The Sakalava Weaver was formally described by Karel Johan Gustav Hartlaub, a German physician and ornithologist. The Sakalava Weaver had been collected by Victor Sganzin, a French naval officer and zoologist. Sganzin was appointed as military administrator of the French outpost at Sainte Marie island (Madagascar), and he explored the Malagasy fauna from 1831-1832 (Sganzin 1840), collecting many bird specimens. When Sganzin returned to the Cape, he gave the Sakalava Weaver specimen to Jules Verreaux (at the South African Museum). It must have been sent to the British Museum at some stage. 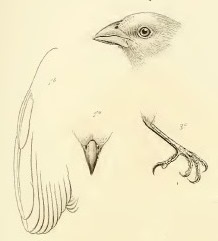 It was overlooked as a new species for many years, until the head ornithologist of the British Museum, George Robert Gray, pointed it out to Hartlaub (Hartlaub 1867), who was writing about the birds of Madagascar (Hartlaub 1861). The first illustrations of the Sakalava Weaver were published by Edwards (1879). The first plate contained line drawings of the wing, head, bill and foot. This was followed by a colour plate of a male and female. Ploceus sakalava	Hartlaub 1861,	Beitr. Faun. 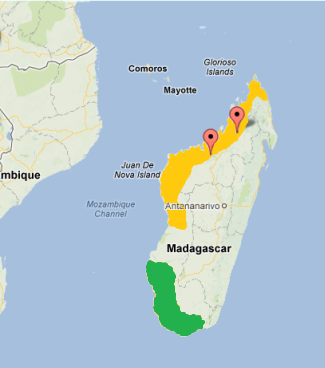 Madag., p.54	Madagascar. 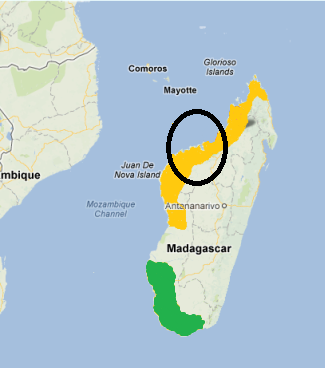 sakalava - After the Sakalava ("people of the long valleys"), a native clan of Madagascar whose kingdom, established in the sixteenth century, was subdued in 1824 and incorporated into a united Madagascar. Sakalava Weaver-bird (Sibree 1891), decades after it was first described. The type specimen is in the British Museum (BM 1845.7.6.10). Identification. The Sakalava Weaver is a colonial weaver found in the drier western parts of Madagascar. The adult male in breeding plumage (photo above left has a yellow head to upper breast, clearly separated from a pale belly and nape. The wing coverts have buffy-white tips forming a wingbar. The iris is brown with bare reddish skin around the eye. The non-breeding male has the head grey, and the skin around the eye is pale pink. The female (photo above right is similar to the non-breeding male but paler. 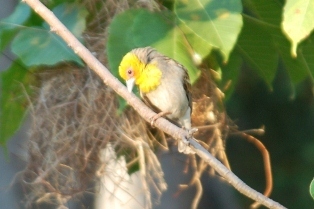 Young birds are green above, yellow below, and with a golden brown wash on the chin and throat. This species is one of 3 weaver species to have a bare skin patch around the eye (the others are the White-headed Buffalo-weaver and the Baya Weaver). Habitat. The Sakalava Weaver is found in open country in drier lowlands, often in areas cleared for human settlement; also found in spiny-bush areas, and dry deciduous forest. Food. 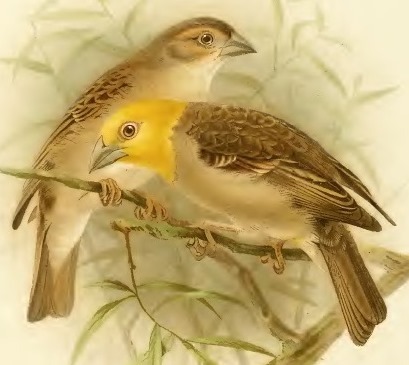 The Sakalava Weaver is mainly granivorous, including some rice. It also regularly feeds on insects and spiders, especially when feeding young. It also feeds on flowers. Breeding. The Sakalava Weaver is apparently mainly monogamous, with some males perhaps being polygynous. This species is colonial, with 10-120 nests at a site, and up to 40 nests in one tree. The nest is sometimes attached below or near the nests of crows or raptors, eg. Madagascar Buzzard Buteo brachypterus (see phown 1489). Nests may also be suspended from the thatched roof of a village house. 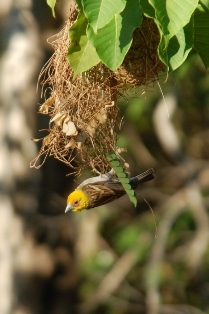 Males sleep in non-breeding nests during the breeding season. Clutch size is 2-4 eggs, incubation is by the female, and chicks are fed by both parents. Nests are preyed on by Madagascar Harrier-hawk Polyboroides radiatus, and eggs have been taken by the Common Brown Lemur Eulemur fulvus. 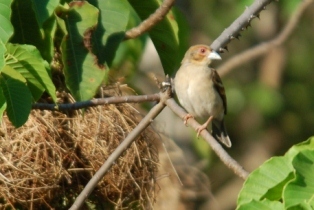 Old nests may be used for breeding by the Madagascar Bibfinch Lepidopygia nana.